I have a very sad, distressing update for you about Chris Dunn. Today a Texas hospital has blood on its hands, as does everyone and every entity - including at least two "pro-life" organizations and the Texas Catholic Conference of Bishops - who have supported the Texas Advance Directives Act and thwarted every effort made to truly reform it. We had a real opportunity to change this law last session based on legislation supported by Texas Right to Life, but those efforts were co-opted by others whose agenda was not to make this law more patient-centered and pro-life, but rather, to carry the water of the Texas Medical Association and Texas Hospital Association, neither of which is pro-life. Make no mistake about it: This man died because a hospital refused to treat him properly. 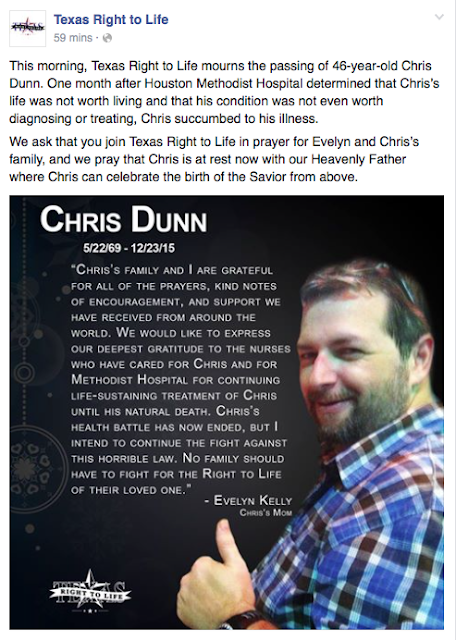 This man died because Texas law allows a hospital to do that without any due process for that patient or his family. Hospitals and doctors want the power to say whether you live or die. The power, but not the responsibility. There is no responsibly when they answer to no one. The only responsibility they might feel would be liability, but they are immune under this law. Texas law has allowed this since 1999. This is not Obamacare. Yet. This law must be changed. Hundreds have been affected by this law. It must stop. It should also interest you to know that Texas Right to Life staff was threatened with arrest by Methodist Hospital when they attempted to go in and comfort the grieving family who had called them to come. The depths to which this hospital will stoop is literally infinite. Texas Right to Life, Trey Trainor, Joe Nixon, and many others tried hard to help this man. Every Texan owes them all a debt of gratitude. They were working for Chris and all of us. But the system is stacked against them. God help you if you land in a Texas hospital. Please keep Chris and his family in your prayers. Pray for those that worked so hard on his behalf, and on behalf of all of us. Also, please pray that this law is changed in the next session. I know I will do everything I can in my own small way toward that end. I pray that you will, too. I will let you know when those opportunities arise. Right now, the efforts are all about getting the right people in office, which I mentioned in my last post (see especially the post script). In the coming days, and already in some news reports, you are going to hear people say: "Well, this is proof he was going to die anyway" or "But he had no insurance" or "Well, he'd not have had any 'quality of life'" or "Well, one family member wanted care to be withheld" or other such nonsense. As to the first, this is not proof of that. It is proof only that medical neglect can certainly kill people. (You can read more about what Methodist Hospital could have done to allow him to be transferred to another facility not set on killing him here and what would happen if that procedure was denied.) He may have had a condition that was treatable. We will never know because we do not even know what his condition was. As to the second, do you want to live in a society that kills for the sake of financial expediency? This is health care rationing coupled with mandatory euthanasia. That is a dangerous path to continue down. It is already being done, but we cannot have this as our medical or social ethic. Third, no institution or doctor or organization should make health care decisions based on what they think your quality of life is or will be or will not be. That is a nebulous term that varies from person to person and opens wide the gate to withholding health care based on discriminatory, meritless reasons. Fourth, family members sometimes disagree. But we err, if at all, on the side of life. Do not forget that Chris himself was able to ask to be cared for when he was not sedated. There is video of this. He asked for his life. That his father disagreed is, frankly, irrelevant and provided convenient additional cover to the hospital which was already using TADA as a legal justification for its acts and omissions. Be very careful if you find yourself going down any of these paths. Be wary of those who feign compassion, but are really supporting euthanasia (though they almost always deny it). And, while we're on the subject, be wary of those who claim to be pro-life and/or are in a pro-life organization but support any version of what this hospital did or what this law allows. They are wolves in sheep's clothing. "God can write straight with crooked lines," I have always heard. I am a Catholic. I believe in God and that He has a purpose for all of us. I refuse to believe that Chris' death - as tragic as it is - is in vain. That poor man suffered at the hands of this hospital and this law. He and his family brought awareness to a law that many are totally unaware of. I wish his outcome could have been different. The hospital, using this law, made sure it would not be. But the battle for the right to life in these cases is not over. Not by a long shot.